We’d love your help. Let us know what’s wrong with this preview of Stonewall by Rob Sanders. 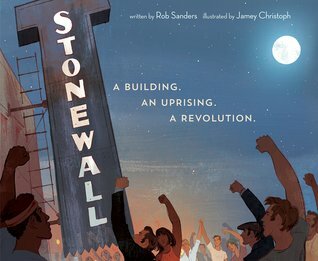 From Rob Sanders, author of the acclaimed Pride: The Story of Harvey Milk and the Rainbow Flag, comes this powerful and timeless true story that will allow young readers to discover the rich and dynamic hi Celebrate the fiftieth anniversary of the Stonewall Uprising with the very first picture book to tell of its historic and inspiring role in the gay civil rights movement. To ask other readers questions about Stonewall, please sign up. I received a preview copy of Stonewall at a literacy convention. I loved Pride by Rob Sanders and Stonewall lived up to my expectations. It's a great history story put into a picture book. I will definitely be getting a copy when it is officially out for release. Amazing! Is it perfect? No. But is it fantastic? Absolutely! And the illustrations- absolute winners! Definitely a needed a book. Love it. So thankful Rob Sanders chose to write about Stonewall, and what a cool perspective (from the building itself!) Also, beyond thankful for Jamey Christoph's gorgeous illustrations! Rob Sanders does not work as a telephone sales rep, a loading dock worker, a trophy engraver, or an editor. But he used to. Rob is not a cowboy, a ballerina, an alien, or a temper-tantrum-throwing toddler. But he writes about them. Rob is a picture book author, a writing teacher, a blogger, and a great uncle. He worked for fifteen years in religious educational publishing as a writer, editor, edit Rob Sanders does not work as a telephone sales rep, a loading dock worker, a trophy engraver, or an editor. But he used to. Rob is not a cowboy, a ballerina, an alien, or a temper-tantrum-throwing toddler. But he writes about them. Rob is a picture book author, a writing teacher, a blogger, and a great uncle. He worked for fifteen years in religious educational publishing as a writer, editor, editorial manager, and product designer. These days he teaches elementary kids about books and words and reading and writing, and writes books for those same kids. Rob’s first picture book, COWBOY CHRISTMAS, was released by Golden Books/Random House in 2012. OUTER SPACE BEDTIME RACE was released by Random House Children’s Books in January 2015. RUBY ROSE ON HER TOES (the first in a two-book deal with HarperCollins) releases in 2016, and Rob just sold RODZILLA to Justin Chanda at Simon & Schuster. Rob also coordinates the Rising Kite Writing Contest for SCBWI Florida, organizes meetings for SCBWI Florida members in the Tampa Bay area, and critiques picture book manuscripts for other writers.